I had a difficult time getting up this morning. Darn jet lag. I set my alarm at 7am, and I was a victim of my own doing….pressed the snooze button. The next thing I know, it was already 8:12….so I got up, and brought Evan with me downstairs to eat breakfast. Nancy got ready upstairs while I ate. I’\’m so glad that breakfast was included as a perk for being a Hilton Honors Gold Member. They served both hot and cold breakfast choices, enough to get our day started. Miradouro de Sao Pedro de Alcantara. It was already 10am when we got out of the hotel and just like yesterday, I used my Visit A City App. I looked at today’s suggested itinerary, I made a few tweaks, and decided to let fate take us wherever our feet would go. And by fate, I meant, Uber! 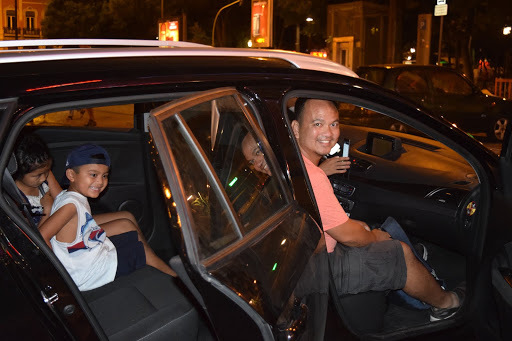 We Uber’d over to Miradouro de Sao Pedro de Alcantara. It was a short 10-minute drive and our driver tried his best to communicate with us in English. 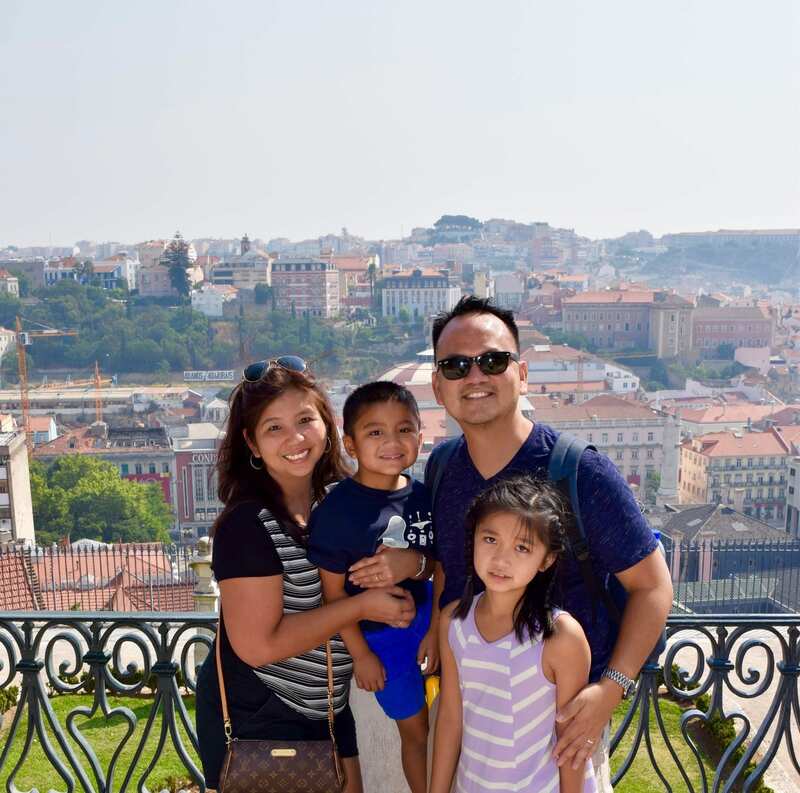 Miradouro was a good place to get the morning started, it’s a lookout point which gave us a chance to see more rooftop beauty along with a vast view of the water to the right. 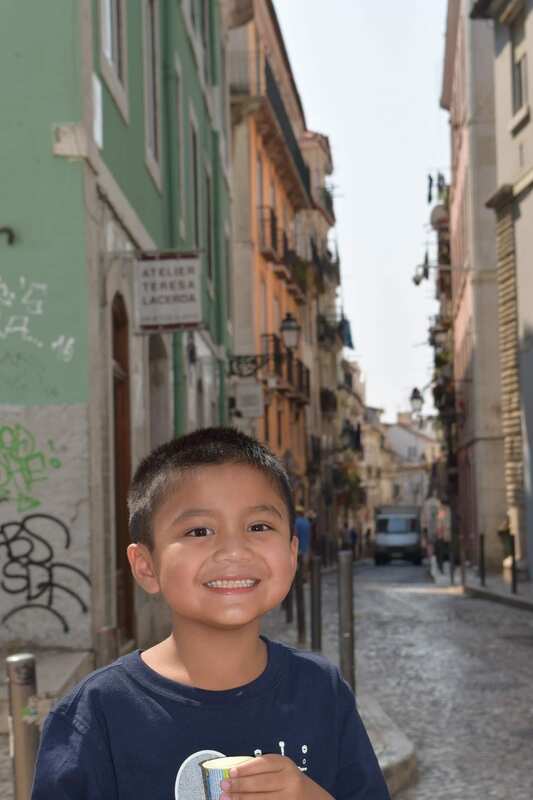 After snapping a few pictures, we walked down around Bairro Alto neighborhood. It was pretty quiet during the day, but at night, it’s known to be lively. We found a coffee shop and of course, I had to try their Pastel De Nata. Another good PDN…..this time I tried with a few dashes of cinnamon powder. It tasted differently, a whole new flavor. I’ve not had a bad PDN on this visit. 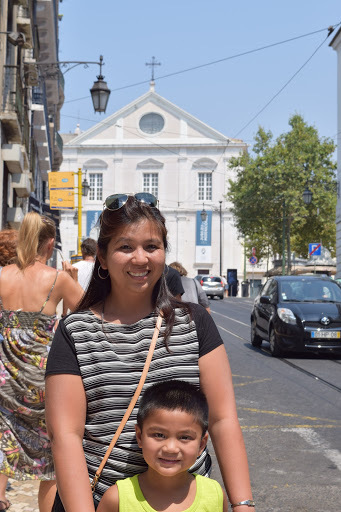 We kept on walking and decided to just aimlessly wander around this side of Lisbon. Every street corner we turned to showed a little element of surprise. 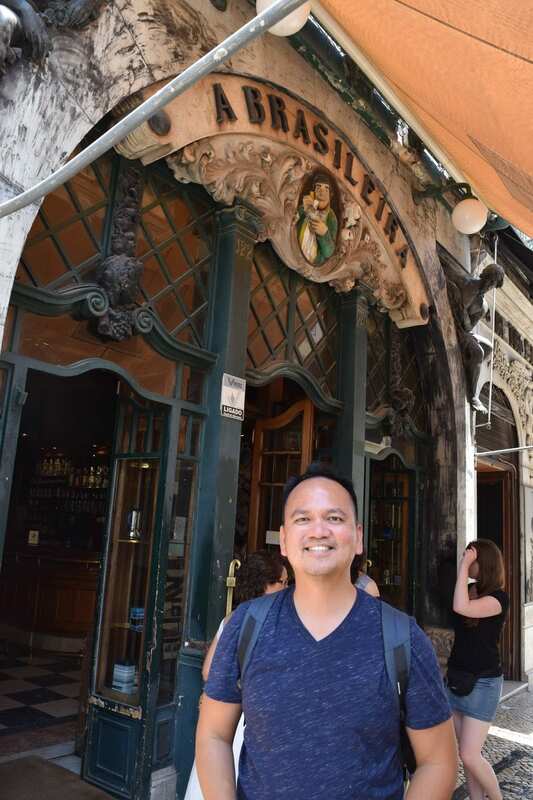 When I was in Paris and Florence, I had a thing for “doors” – now that I’m in Lisbon, it’s not about the doors, but the tiles. Not the tiles on the floor, but the tiles on walls of the building. They were all so beautifully decorated, each one different from another. We just kept walking, and walking, didn’t really have a destination in mind. I think that’s what made it interesting for us. We stopped where we wanted to stop, we didn’t restrict ourselves from sticking to an itinerary or agenda. Just like what happened yesterday, Evan and Caitlin saw the Golden Arches. They have been so patient with all the walking. Not gonna lie to you, they would complain every now and then, but somehow we manage to appease them when they find something interesting along the way. After McD’s, we stopped at A Brasileira, for what? Pastel De Nata!!! 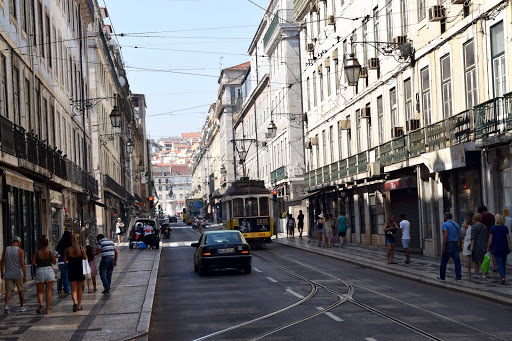 It was located in a very busy intersection near the Metro in the Baixo-Chiado district. 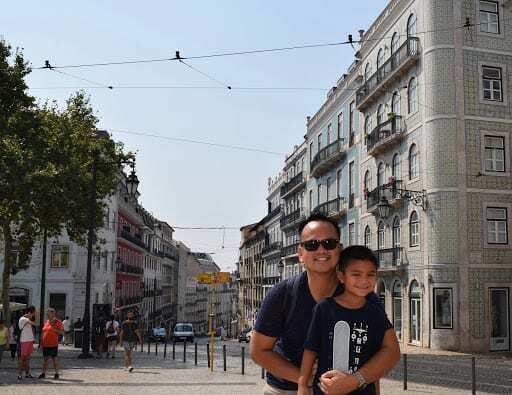 We hung out for a bit, and decided to just keep on walking….stopped at a local bookstore, H and M, a toy store, and finally, we were able to see the Elevador de Santa Justa. The line was so long and we didn’t feel like standing under the hot sun so we kept on walking. 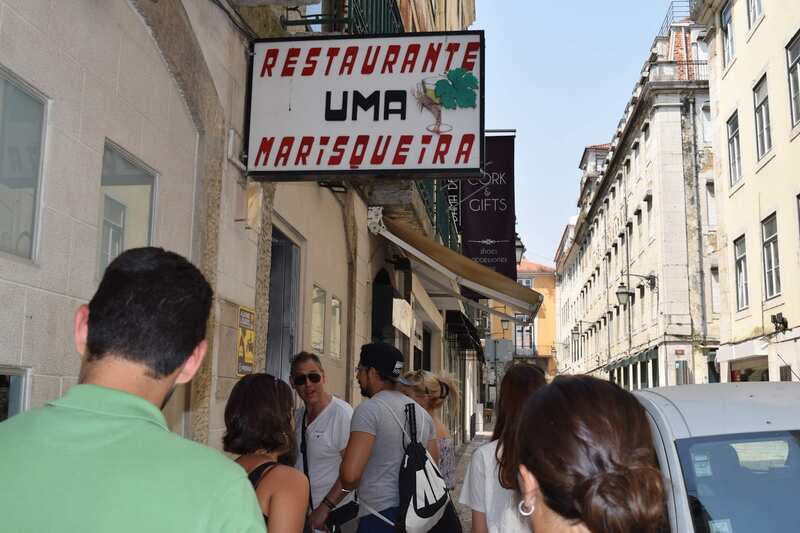 Not far from the Elevador was a little street and to the right, I noticed a group of 15-20 people waiting right outside this little hole in the wall of a restaurant – Restaurante Uma Marisqueira. Curiosity got to me! I couldn’t tell what they served. I checked Tripadvisor, over 1,200 reviews averaging 4 stars. We couldn’t get in during lunch. We were in a very touristy area, yes there was this little restaurant that got people’s attention. We walked away and ate a quick late lunch at Restaurante Ne’Ne’. Nothing to write home about, but it was a much needed break from all the walking that we’ve done. 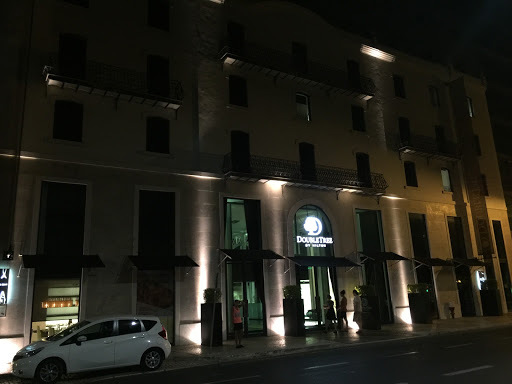 Shortly after we ate, we walked for a couple more minutes and headed to Arco Triunfal Da Rua Augusta. 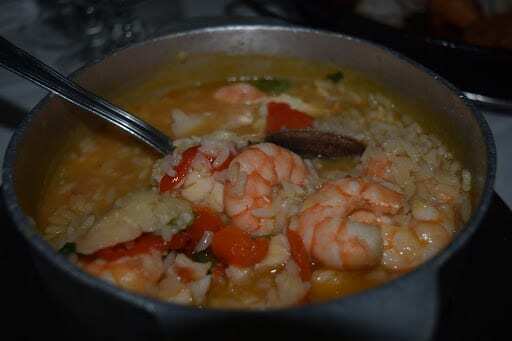 Since we were already in the area, and the thought of missing out on Uma Marisqueira was killing me. So we decided to just see where the rest of the afternoon took us. 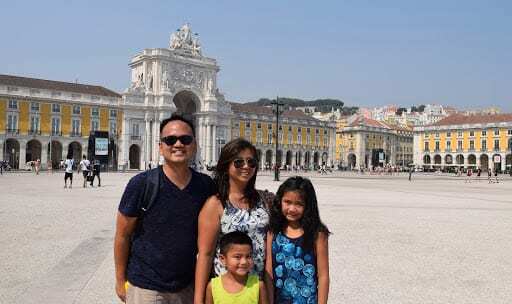 We passed by a plaza with a couple of fountains just before Rossio train station. We decided to take a break and recharge at Starbucks, free Wi-Fi, and we were set. 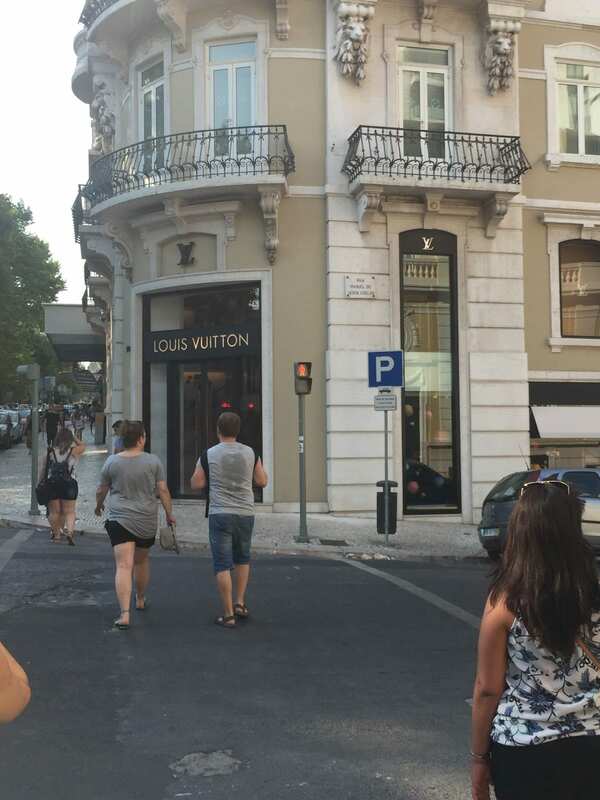 We walked up and down Ave. Liberdade where a few of the high end signature stores were located. Nancy fancied on visiting Louis Vuitton while Evan, Caitlin, and I enjoyed their free Wi-Fi and cold water. Oh, I didn’t tell you this, but I called my hotel earlier to try and inquire if he could get me a reservation at Uma Marisqueira, but Uma is not really all that great with reservations, instead, Guilllermo from the hotel front desk, got us a seat Pinoquio, another great seafood restaurant on the Avenue. As thankful as I should be for what Guillermo did, it was just one of those things where my heart was dead set in trying to get us in at Uma. So at 7pm, we hurried down to Uma and by then, they had already allowed around 20 guests inside, and there were about 15 more people ahead of us. Grrrrr! We had to come back and waited another hour for their house special “O Melhor Arroz de Mariscos”, which in my best understanding of Spanish meant it had the words “Seafood and Rice.” But little by little, the 15 people dropped like flies, we were down to about 10. The wait indeed was long, we were finally called in at 8:20pm. Since I spoke no Portuguese, I flagged someone (another person waiting in line with his family). 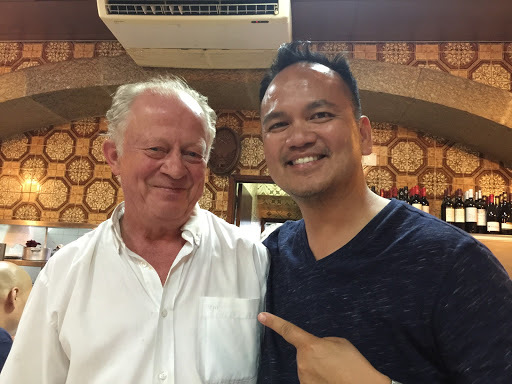 He spoke to me in English, his name was Mario (from Madrid). I told him what I wanted to order and I just wanted to make sure that we didn’t order a feast for the entire restaurant. He said he’d help me once we get inside. But why the long line? It was located in a very “touristy area” but most of tourists went to the restaurants on the main drag. This one was tucked off to the side. You really have to be in the know, or just extremely curious (like myself) to really want to know why there was a long line. Uma was ran by three people….and they’re not very young either. They must be in their 70s or 80s. The main chef, and 2 servers (a lady I assumed was the chef’s wife, and another older man). The dining room probably accomodated 30 at best. It was tiny….30 x 30 perhaps? It was one of those restaurants that made your dish as you ordered them. 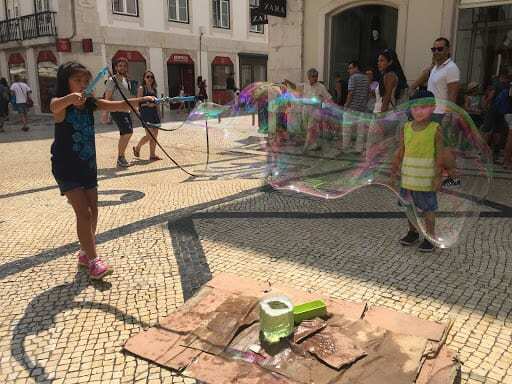 I learned in Portugal to wait…to be patient, not to rush. The chef also was a waiter. He was the one who took our meal orders. All I said in English was Arroz de Marisco for me and my wife, and steak for my kids. He nodded, and walked away. Nancy wasn’t comfortable that I ordered the right things so I flagged Mario from Madrid. He talked to the lady server and confirmed our orders. The chef nodded and agreed that he got it correctly. Yay me! From that point, it took another 25 minutes or so to get our food. Again, nothing fancy here. The meal came in this cast iron looking pot. It was quite aromatic. And the colors…all reddish/orange in color. 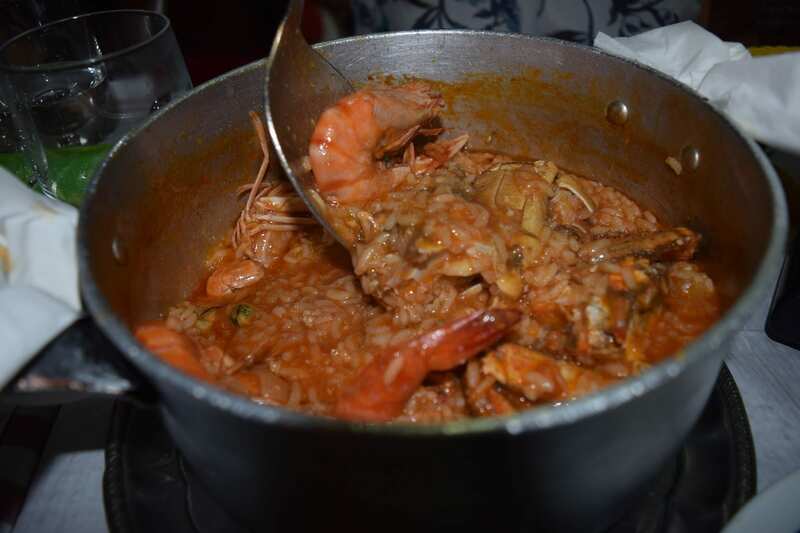 It was a pot of hearty shrimp, crabs, and mussels that swam along with the rice. Typing this just made my mouth water. Nancy and I agreed that it was truly a simple dish. Honestly, something that I’ve also made myself back in California. The takeaway here is the simplicity of the dish. It felt like a homecooked meal. No fuss. No non-sense. Just down-home good! You ever have those moments when you’re at a restaurant and people were outside looking at you, praying you’d finish soon? Looking at you as if you were in an aquarium? Yes, that’s how it felt like. It took us close to 1.5 hours to finish our meal. It was that hearty. The portions were generous. The seafood was not overcooked. The rice was perfectly tender. I’m Filipino so there was no way I’d end up with clean hands. I used my hands to peel the shrimp and maneuver my way in eating the crabs. After all, it wouldn’t have been fun if I used a fork. After dinner, our check came. We ordered the arroz de marisco, 2 bottles of water, steak and fries, and bread/cheese. We estimated $50 Euros. We were wrong. Our meal came to $36 Euros! Bam!!! We enjoyed it, and would recommend it, however, would strongly recommend getting there EARLY otherwise the wait is inevitable. We were done at 10pm and we walked a LOT today, time to go home…..so that’s my excuse for eating the way we did….we walked off our meals. Uber again was the choice to get ourselves back to the Doubletree Hotel. Good night. 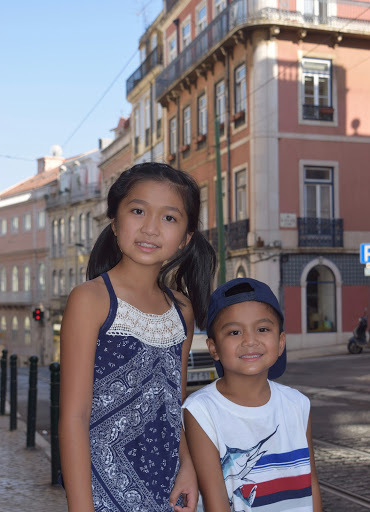 It’s now Sunday, our 4th day in Lisbon. You would think that we’d get used to the time by now. Well, in some ways, yes….but, heck, we’re on vacation. 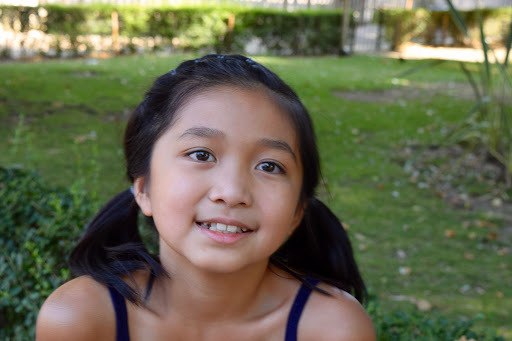 Since the days are quite tiring with all the walking we’ve been doing, once we get to the hotel, we shower and wash all our cares away and relax in the evening. This morning was no different. It was already past 8am when I got up. So it was lather, rinse, repeat. Grabbed breakfast downstairs, and prepared for our day. I’ve been following Time Out on Facebook, and I believe, I follow them on Twitter as well. I read some of their articles in NYC, London, and Paris. I just realized that I don’t follow Time Out LA, so it’s a good thing I wrote this article, I just now followed Time Out LA. 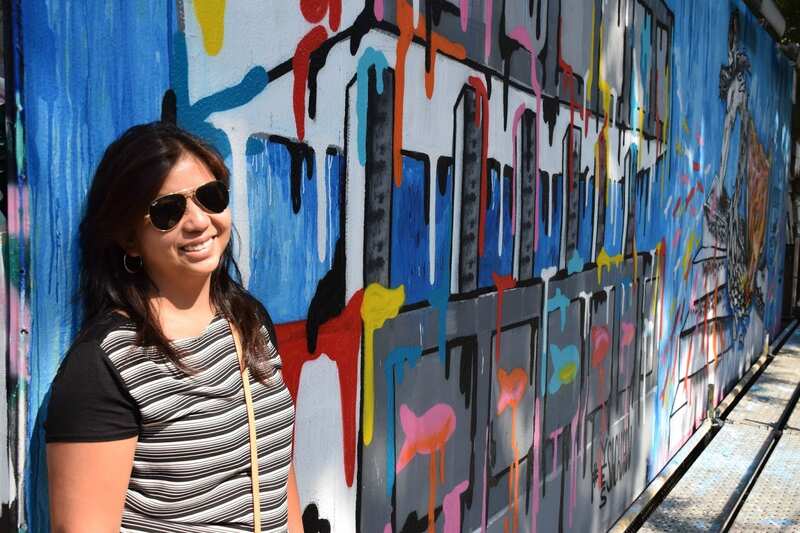 When I think of Time Out, I think of getting travel tips, food tips – that’s the kind of news I follow and read. 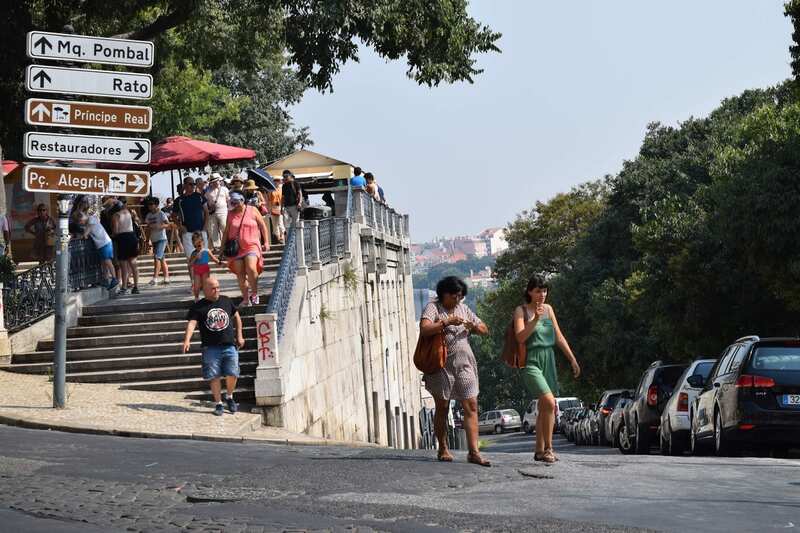 So when I was doing my research on Lisbon, I saw Time Out, and it immediately clicked. There was a bit of familiarity to me. We finally got out of the hotel by 11am. Our plan was to catch Electrico 28 (or Tram 28). 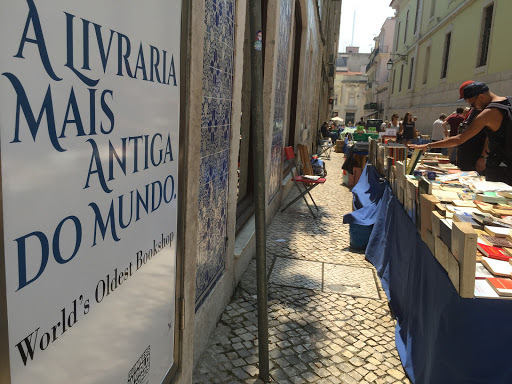 Instead of doing the touristy thing this late in the morning, I suggested we head straight to Time Out Lisboa. I went to my phone and pulled up the Uber app and within 3 minutes, the Uber car was there to pick us up. 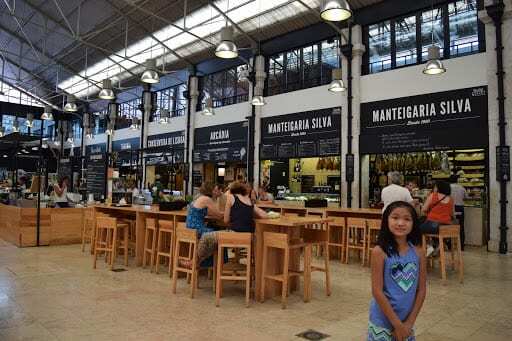 We made it to Time Out or Mercado da Ribeira in no time. It was around 11:30 when we arrived. There were people, but not that crowded. It reminded me of NYC’s Chelsea Market, Anaheim’s Packing District, and San Diego’s new Liberty Public Market. Getting there at 11:30 gave us a chance to wander around, check out the scene, and see where we would like to have lunch. 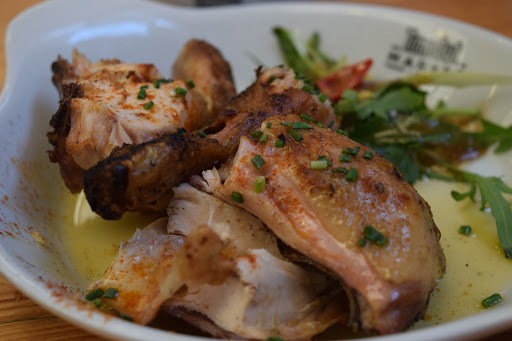 For the kids, they went and ordered Frango Piri-Piri chicken. It was grilled. It’s the kind of chicken my kids love to eat. It’s got a little kick, but it wasn’t too spicy. It was served with fries. Caitlin and Evan were able to share that just fine. I, on the other hand, went to Marlene Vieira’s stall, and ordered the seafood risotto with swordfish tataki, lemon, coriander. I make my own lemon risotto, so I knew what to expect. The one I got wasn’t as “cheesy” and I kinda liked it. It had a lot lemon flavor. 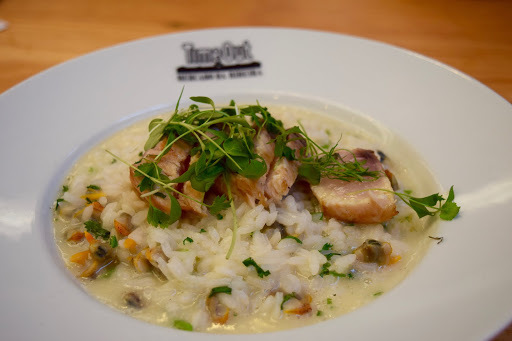 The swordfish sat on top of the risotto and it was perfectly seared. Nancy and I shared this bowl of risotto…so delicious. 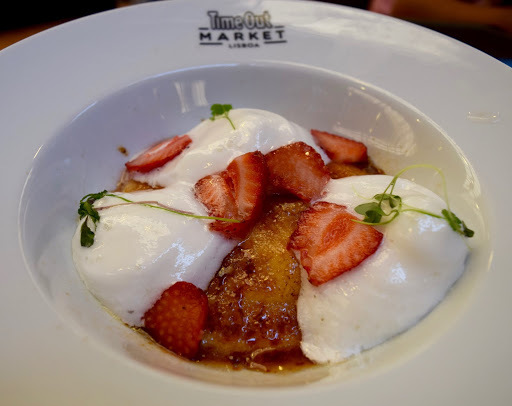 For dessert, we stuck with Marlene Vieira and ordered Creme’ Brulee with strawberries and pennyleaves. The leaves, simple as it may have looked, was the pleasant surprise. I couldn’t tell if it was minty or lemony….but there was a nice distinct taste. All in all, we truly enjoyed our meal at Marlene Vieira’s. I have to admit that I didn’t remember where to catch Tram 28, nor did I remember how to get tickets. 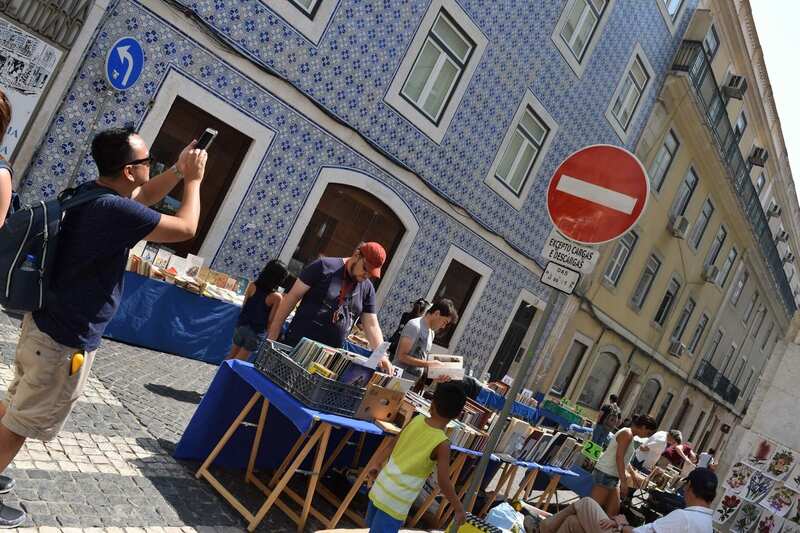 Thankfully, as we left Time Out Market, we asked a local and he advised us that we can go to the train station across the street and add funds to our Viva Viagem. So we crossed the street and I followed the signs to these “GREEN” ticket machines. I waited in line for about 15 minutes or so. 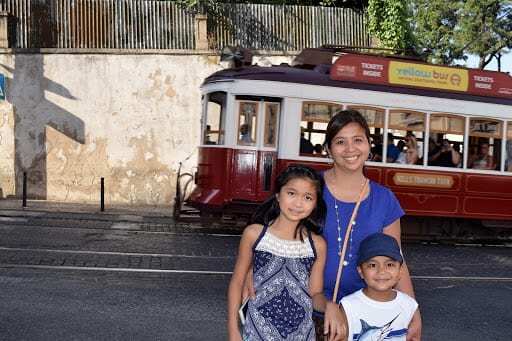 By the time we got close to the machine, Nancy asked one of the helpers about Tram 28, and she instructed us to go to the Metro Station and get our Viva Viagem refilled there instead. Ugggghhhh….that was my mistake. 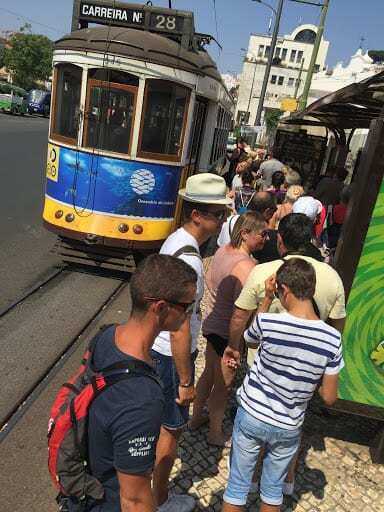 So we walked down to the Metro station, and that was also where we caught a train to Martim-Moniz, the place to catch Tram 28. When we got there, there must’ve been a 60-70 people in line. It took about 45 minutes for us to get on the Tram. We were under the sun 1/2 the time. It was very hot. But we survived. LOL!!! The driver did not fill-up the tram. It made sense. He picked up more passengers along the way. I used my GoPro to document the ride, I can’t wait to see the footage. Honestly, I had no idea where we’d end up. But I didn’t care. It was an experience we wanted to have. We were one of the last ones to get on board and fortunately, we were able to find 3 seats (for the 4 of us). Two of them were window seats which was perfect when I used my GoPro. 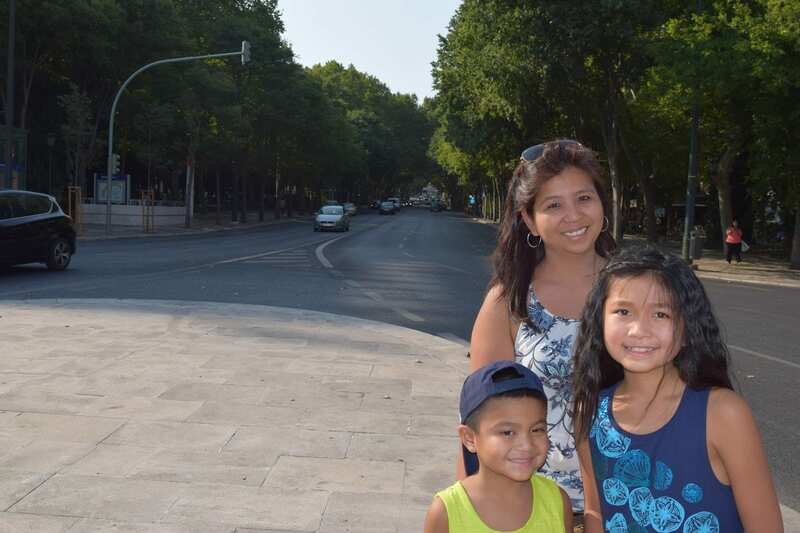 I was amazed at the streets that we went through….so narrow, extremely narrow. 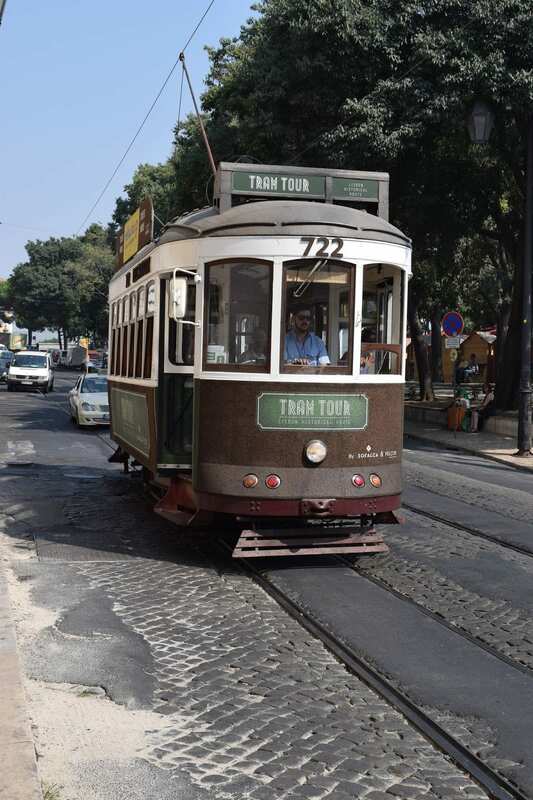 Yet the tram was able to maneuver up and down those streets. 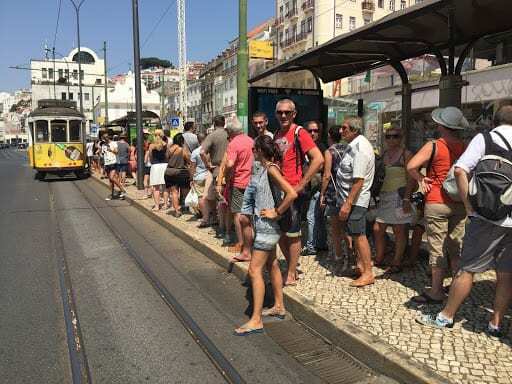 Little by little, the tram picked up more and more passengers. Not sure if there was a thing such as capacity. But I think as long as there was room, they will try and fit everyone. 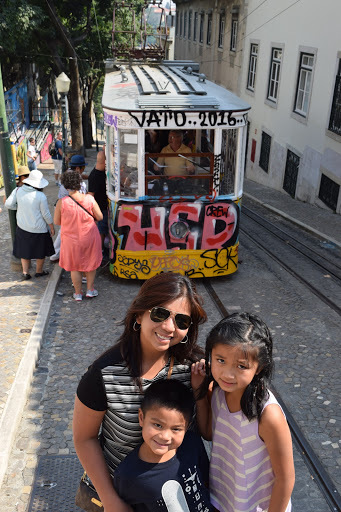 At the end of it all, I was glad that we picked up the tram from Martim-Moniz, the starting point. 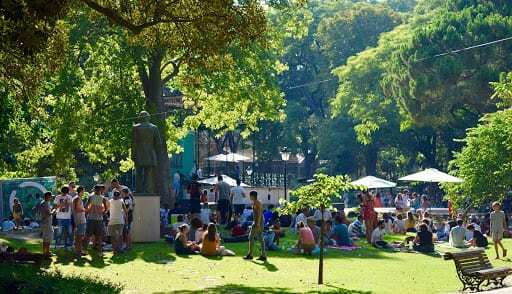 After about 40 minutes, we ended up in Estrela, there was a church and a huge park. 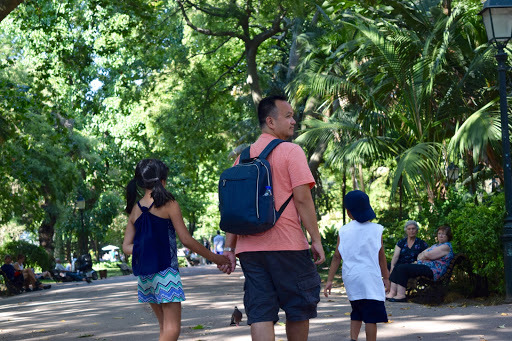 We rested for a bit and walked across the park. 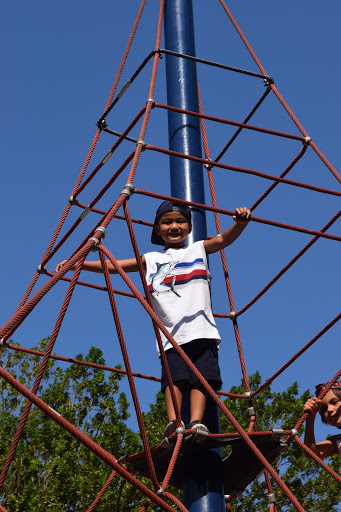 It was unplanned but when it comes to parks, my kids are kids and enjoyed the playground. 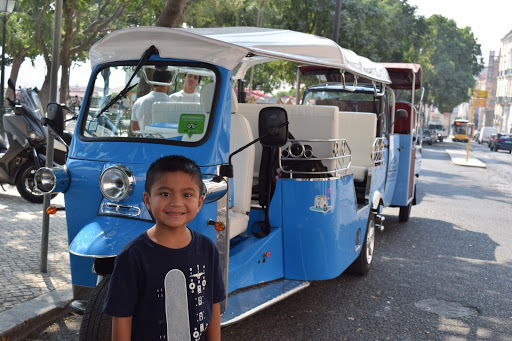 We all had ice cream and enjoyed the Out Jazz music festival that was happening on this very laid back Sunday afternoon. I felt like we were with the locals instead of being with lots of tourists. It was great! Since we were able to rest for a bit, we decided to turn left outside of the park and wandered down the street quite aimlessly. Honestly, we did not know where we were going. We just kept walking downhill. And that helped a lot. We didn’t walk up any steep hills or anything. 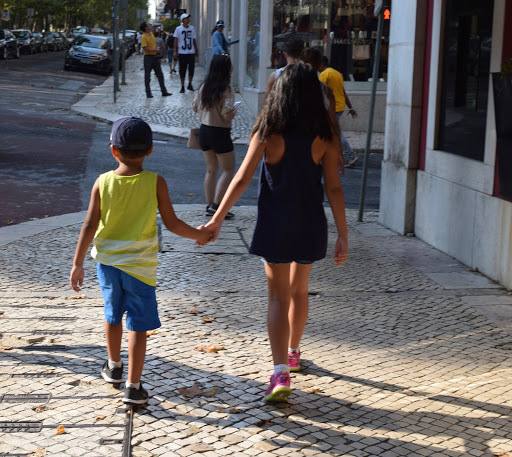 We walked for about an hour, until we decided to catch a bus to go to Praca Figueira. We were treated to more views of Arco Triunfal Da Rua Augusta…..it looked so much more majestic in real life. The yellow color is what made it stood out even more. 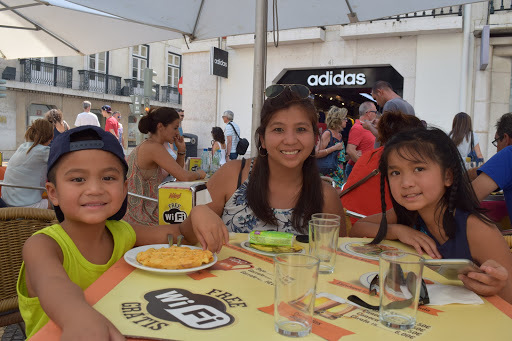 We made it to the Praca and my little 7 year old Evan remembered the empada (not empanada) place, sure enough, he asked for the Galinha Empada, while we also ordered the spinach and cheese, and mushroom and leek empada. 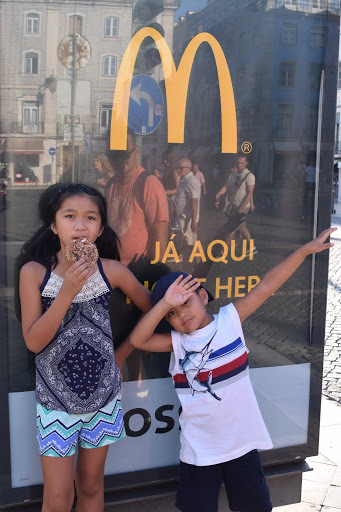 We made our way towards Rossio station and chanced upon the golden arches again. 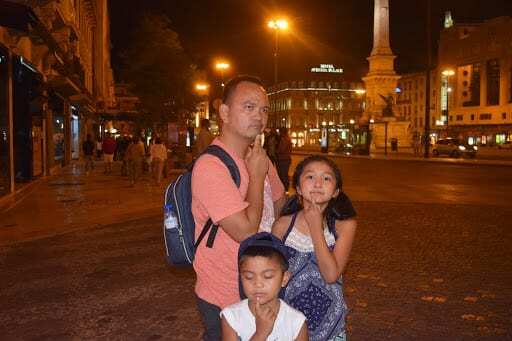 Yes, it was not really my first choice whenever I travel, but with the kids, why not? It made them happy and that’s what it’s all about. Also, it gave us a chance to charge our phones and rest for a bit. 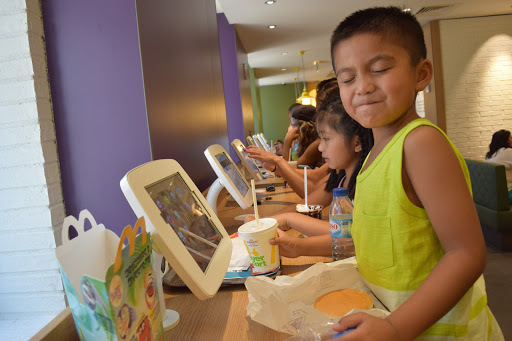 After a 1/2 hour at McD’s we walked over to Pinoquio for dinner. This was where we were supposed to eat the night before as it was reserved for us by Guillermo from the hotel. 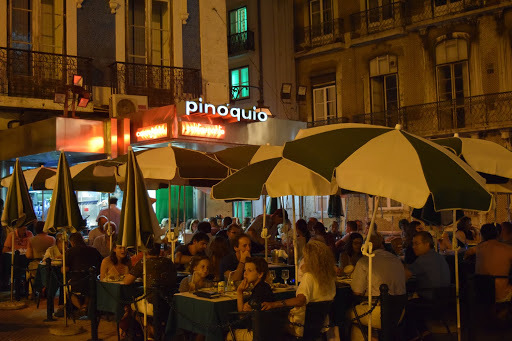 Pinoquio is located on the Ave. Liberdade. You just can’t miss it. 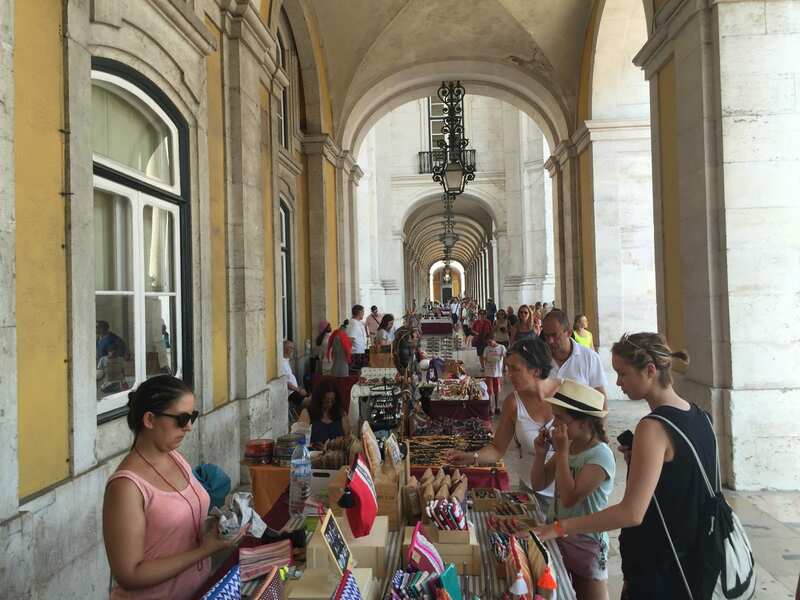 It’s right across Rossio station. At 7:30pm, the outside was already packed. The inside was also huge and spacious, but by 8pm, that too was packed. We got lucky. We had reservations but we were seated immediately. We kept it simple. 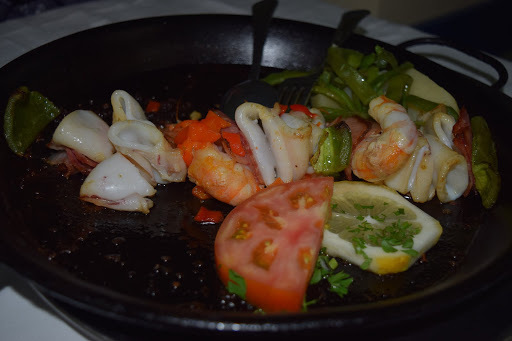 We ordered Arroz de Mariscos (for 1 person) and Grilled Squid on Skewers with Prawns. After about 15 minutes, our meal came and I was surprised at the generous portion of the arroz. I thought since we only ordered 1 that it’d be a tiny portion. It was still good enough for me and Nancy to share. 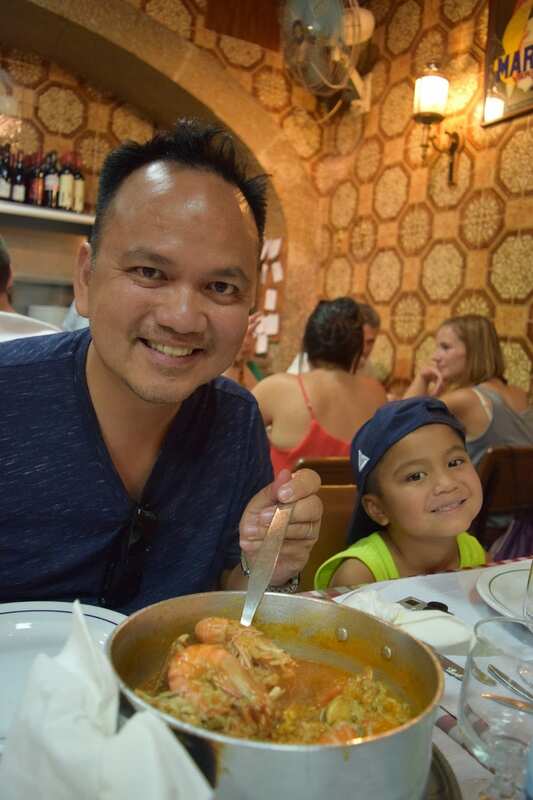 I do have to say that while the Arroz at Pinoquio was good, loaded with lots of shrimp, lobster, and clams, however, I preferred the arroz from Uma….I liked the sauce better, just a preference. 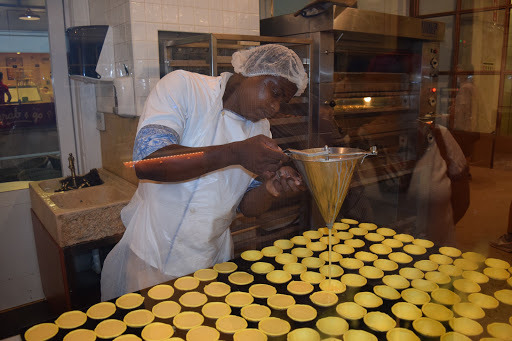 However, we were all about checking out new things and we can say that we’ve tried Pinoquio. As we walked out after our dinner, we saw others who ordered paella. It looked wonderful, maybe we’ll come back and try that. It was already 9pm when we finished dinner. We were once again recharged. The night wasn’t warm per se, but it was nice enough for us to stroll. 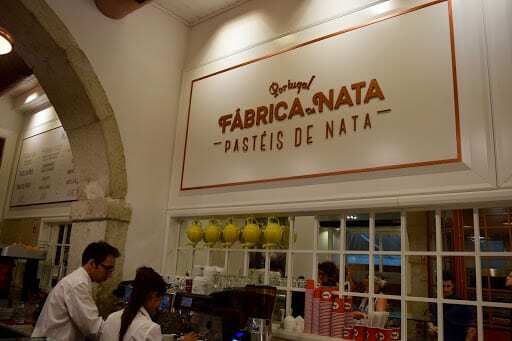 We stopped at Fabrica Nata, there was a window where there was a guy who was working and showed us how he prepared the Pastel De Nata before putting them in the over. 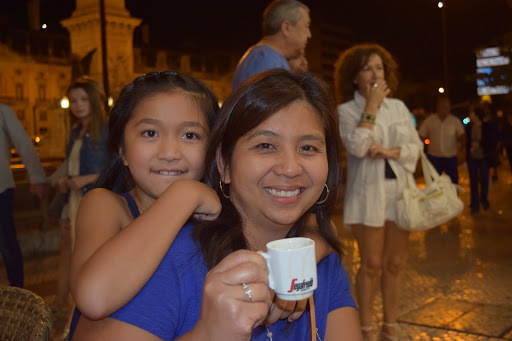 I ordered 2 PDNs and 2 espressos…..that, and a few chairs outside were enough to cap off our evening. How did we get back to the hotel? Uber. I’ll write a whole new section why Uber has been the choice, not just for convenience, but the value. Thanks for following our journey. 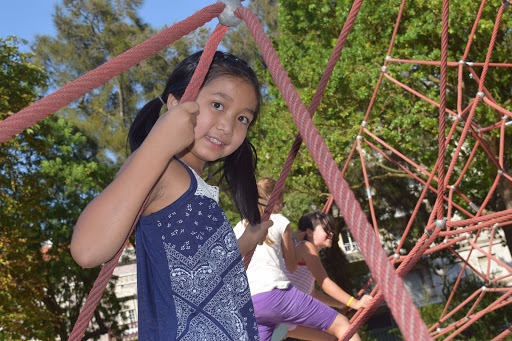 Here are a few more pictures.